Q: What kind of hours would you put in, Dennis? DL: Yeah. But again, I’m not saying that was just me, that’s the way everybody operated. Boyd Epley, Chris Anderson, all those people? We put in a lot of hours. I know I didn’t put in as many as the coaches did, but you know, we put in a lot of hours. We’re very involved in recruiting as well, and especially now, one of the things that stands out in recruiting is the academic part of it. That’s what sells a parent, when they visit here and realize their son or daughter is going to get a great education along with competing, and that means a lot to them. I think a lot of people who come here from outside the state are very pleasantly surprised at what they’re gonna be able to experience academically. Q: Where are you when game time arrives? DL: Game time? I’m in the stands. In the stands with my family. Back in those times we had -and still do, a more scaled-down version- but we had a Guest Coaches Program at that time. We really started that back in the late ’80’s. At that time, on every Saturday Keith Zimmer and I would host two to four faculty members for a home game. We would start out and they’d get to sit in on the meeting with the coaches out at the Kellogg Center on Saturday morning. They’d be in the big team meeting with Coach Osborne when he talked to the entire team and then we’d split up and go into the position meetings, and Coach Osborne would let the faculty members go to any position meeting that they wanted. DL: Oh yeah. (laughs) And of course, in those days, many times they wanted to stay in the quarterback meetings with Turner and Tommie and Brook, so there were times when it was Tom Osborne, Turner Gill, Brook Berringer, Tommie Frazier, Matt Turman and three or four professors. (laughs) And Coach Osborne would say, ”Here’s what our first play is going to be,” and, “Here’s what we’re going to try to accomplish with this.” And even though they went through and covered everything, everything was so calm… and we were getting ready to play Oklahoma and Colorado and we’re all sitting in there. There were times when I’d be, ‘Wow, this in unbelievable. This is something I can’t even believe I’m getting to sit in here,’ you know? Q: The ultimate fly-on-the-wall type of situation? DL: Yeah. And it’s not something you really talk about with anybody, because you knew that was sacred, to keep that in that room. But the faculty members felt like such a part of it. I think that’s where Coach Osborne did such a wonderful job leading the program. He made everybody feel a part of it. So when you won a national championship or somebody graduated, everybody felt a part of it. I’m not just talking about the national championship, I’m talking about when somebody graduated when nobody felt they would, all sorts of people felt a part of that because they’d surrounded the young man the 4-5 years he was there. But the Guest Coaches thing was a fun thing, and we’d bring them down into the stadium and give them a tour: they’d sit in the recruiting luncheon with the recruits, and the coaches would come in there and talk again. And 30-45 minutes before kickoff, when Coach Osborne would come out of the locker room, Keith and I would have the guest coaches out on the field and Coach Osborne would go right over to the sideline and take two or three minutes and get his picture taken with them on the field. A lot of people don’t know that he did all that. And then after the game they would go to the press conference, and he’d always come in and shake their hand, win or lose. So these people got to see it. And I forgot to mention at the beginning, they had the team breakfast with the players over at the Kellogg Center on East Campus, too. So they would see it from the breakfast in the morning to the press conference after the game. Q: Wow, do you recall any comments from the faculty members? DL: Not so many comments. I know that I have file full of letters that people have sent through the years, and they say it was such an unbelievable experience. I think they were always extremely impressed with how the operation operated. That goes back to everything from the student manager who had all the rolls of tape out in preparation for the players getting taped, to the preparation for the meal, to how calm the coaches were, and how five hours from the point they were visiting with the coaches, these coaches were going to be on national television being scrutinized for everything they did, and how they were so calm and taking time to sit down and visit with them. I think what people were always so impressed with was the way everything operated and how calm everybody was. Now, I’m sure internally maybe everybody was not, but it was how calm they seemed to be on the exterior. Q: That’s pretty neat, Dennis. Even I didn’t know that existed. And speaking of, is there any memorable player or experience worth reflecting on from those years? DL: Well, Kevin stands out. Maybe not so much for that, but Kevin was a guy that -and it was well publicized at the time, when he didn’t qualify with his grades out of high school- and I got permission from the Big 8 Office at the time. I got permission to get Kevin to move into my basement of the house I’d just bought to prepare him to retake the ACT test again. And I don’t know if you could get permission to do something like that now, but he did that. And so, then Kevin took the ACT again and got the score he needed and the rest is history. But I think Jason and Christian Peter are two that stand out, you know? A lot of laughs. Keith and I talk about some stories from the past and chuckle sometimes. I guess there are just so many guys, a lot of great memories. And Kevin, he’s a great friend. He’s one of those guys, on his recruiting visit he looked you right in the eyes and said, “Hey I’m pretty good out on the field, but when it comes to this classroom stuff I’m not very good.” And then to go on and graduate in 4 years and his last year being named Academic All-Big 8 at the time? And go on and supervise how many people he supervises now? He probably already told you, but the guy is doing great, has a beautiful family and he’s been very successful. All the things he learned in football he carried over into the workplace. Q: And as far as carryover, what are some of the main points that football athletes carry over into the working world? DL: I think the main thing is the teamwork aspect of it. When you watch a football game and you see 11 players line up and they’re all from absolutely totally different backgrounds and their goal on that play is to move the football down that field, and every guy has their responsibility. You have the offensive lineman who’s not going to get a lot of glory, and there are many jobs that are performed every day where you do the work and somebody else gets the glory for it. And that unit operating together as one, you don’t get that very many places except in athletics. 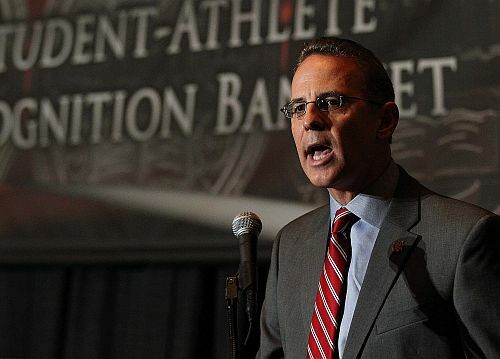 And you know, there’s an award handed out every year called The Top 8 Award, and it goes to 8 student-athletes in the United States and represents what we really want athletes to be: perfection in the classroom, in their sport, and in the community, and Nebraska has had 16 of those people win that. It’s considered to be the Heisman of Academics. Stanford has had 13 people win it, UCLA is there with 10, and out of the 1,400 schools there’s only three schools that have had more than ten, the three I just named. When Payton Manning won that award his senior year (and I hate to have this as an example because he’s from Tennessee) (laughs), but he said something to the effect of, “It would have been a lot easier for me to go to college and just play football. And on the reverse side of that, it would have been a lot easier to just go to college and not play football. But I wouldn’t be the person I am today if I’d not done both.” And I think that defines college athletes a lot of the time, because they make sacrifices when they’re an athlete, you know? For instance, maybe instead of ending up with a 3.6 GPA maybe they would have had a 3.8 if they wouldn’t have had to spend all the hours they did in athletics. And on the reverse side, maybe they would have been able to be a better football player if they wouldn’t have had to worry about school. (laughs) But they recognize on both sides of it, they would not have been as complete a person if they hadn’t done both. I’m truly convinced that if Kevin Ramaekers wouldn’t have been a football player, he wouldn’t be where he is today. That’s a part of who he was, but the part where he benefited the most from his football days wasn’t going on and playing in the NFL, it was the transferring of all those skills he learned as a football player: teamwork, loyalty, respect, belief, some of those things you mentioned earlier. He wouldn’t be the employee he is today without that, and he learned that through Nebraska football. And I think you would find many people out there who would say the exact same thing. Q: The Lord works in mysterious ways, eh? DL: That’s exactly right. And that’s the reason I believe in Nebraska so much. I came to Nebraska in ’83 and I truly have no desire to work anywhere else. It’s a special place. Football is the main cog, but what people are fooled a little bit through that process, is what results from that. When it’s all over, yeah, maybe somebody wins the Heisman Trophy or Outland Trophy or rushing title or whatever, but when it’s all said and done you’ve created better citizens who’ve created unbelievable relationships. And when they come back they talk about national championships, but not as much as they talk about relationships. You know, I can remember on Valentine’s Day one time, my wife had sent me a big box of chocolates. And I’d gone to some meeting, and when I came back to my office the blinds were closed and my door was shut. (laughs) I opened the door and Christian and Jason Peter were sitting in my office with their feet up on my desk and they’d eaten half of the chocolate, thrown the paper around my office. And they said, “Hey Pencil Neck, what’s up?” (They always called me Pencil Neck) And there are so many stories like that. So anyway, it’s been a fun ride, and it’s great to have Coach Osborne around here again. Q: Do you recall anything from the ’93 to the ’97 years? Do you recall any cultural or organizational changes as far as the players’ mindsets of the time? DL: Well, I think the talent level went way up. I guess that’s the main thing that I would say. I think it was probably a process, and there are things you learn every year from the one before. Coach Osborne was always doing things to tweak the program. And although we won championships in those years, Paul, I guess I look at it a little bit differently. I really feel that all those years were championships years. I look at it a little differently. Sometimes people only think it was a success if you won the championship, but I think there was a process of getting to those years, other years where things had happened, maybe something with a certain individual that made it a championship year. And some people might say, ”Well, that’s what an Academic guy would say.” (laughs) But looking at the entire process of leading up to those years in Coach Osborne’s career, although we won championships in ’94, ’95, & ’97, there were a lot of success stories in other ways, as well. And Kevin Ramaekers was one of those young men. Kevin never won a national championship. Trev Alberts, either. Those guys were laying the foundation work for years to come after that, but what I wouldn’t want to do is take away from teams that didn’t win national championships. They were still very successful as far as how I look at it. Q: Wonderful perspective, Dennis. Thought-provoking. It sure changes my perspective a little bit. DL: I think that’s where Coach Osborne revealed a great perspective on it in his book ‘More Than Winning’. When it was all said and done, there were all the other things you’re getting from it, because you’re going to go on and those things will help you in your life after you leave Nebraska. I would like to think that Nebraska football is more than winning national championships. I see it as more than just that. National Championships are great, and they’re great to celebrate, and that’s what you’re shooting for when the season starts, but we all know that those days you could go undefeated and not win the national championship, so it doesn’t mean the season was a failure. And I would probably, when you visit with Coach Osborne, there were probably some teams he coached that didn’t win national championships that meant just as much or more than those teams who did. And there are some coaches out there that are just so focused on the national championship that they lose sight of what you really want to accomplish with 150 young men, because now it is all about winning the national championship in the public’s eye. 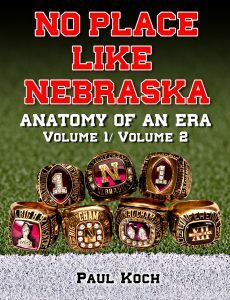 But when intercollegiate sport was started over 100 years ago it was to provide extracurricular activity where somebody is able to learn other things, and I would like to think that Nebraska has still stayed focused on that throughout the entire department. Q: Last question, Dennis. How many total athletes do you serve there at a time? DL: We have around 550. It’s around 150-160 football players. Q: You’ve got your hands full, my friend. DL: It’s a lot of fun. We have a lot of great help. It’s been a fun thing for our family. We have a lot of fond memories of bowl trips and places we’ve been able to go. Q: A different Santa Claus every bowl game Christmas Dinner in the team hotel, right? DL: You’ve got it. And it’s been wonderful for my kids to grow up around as diverse a community as you’re going to find in Lincoln, Nebraska. I’ve always felt that I’ve learned way more from the athletes that I’ve worked with than I could ever pass on to them because they come from so many different backgrounds, whether it’s someone from South Africa or someone from inner city L.A. or someone from Wahoo, Nebraska. What a blessing to be able to work every day at Memorial Stadium and have an opportunity to work with these young men and women from all over the world and have my family have an opportunity to be around them. You cannot find a laboratory like that anywhere. Q: Well, thanks, Dennis, for all your time and for all the new and valuable perspectives you’ve brought in our time together here. DL: Well, I think that through this process you do Coach Osborne justice. It’s way more than the national championships; that’s who he is, and you don’t want to lose perspective of that. And I’m not saying you have, but he’s defined by more than those seasons in the ’90’s. That’s always something worth remembering. Dennis also brought up the Guest Coaches Program on home football weekends. What a stroke of genius! Not only for its educational and entertainment value to the professoriat, but for the goodwill it engendered to an often otherwise ambivalent and at times an even hostile sect on the campus. I don’t mean to go off on a rant here, but we all know that one of the greatest bastions of liberalism and the entitlement mindset in America is on the college campus, possessing a heavily laden socialist ideology that more often than not flies directly in the face of the game and spectre of the sport of football: handouts & entitlements for merely existing versus rewards for proving fit for top competition, pacifism vs. a war-like activity, anti-capitalist/Marxist ideals vs. a million-dollar money generator, diversity for diversity’s sake vs. the need for purely athletic, young males regardless of race. Perhaps I’m over-generalizing a bit here, but trust me, I had my share of run-ins with some envious and outright anti-Athletic Department instructors in my day.